Despite how many times I've been to Europe, there are still countries and regions that I have yet to visit. 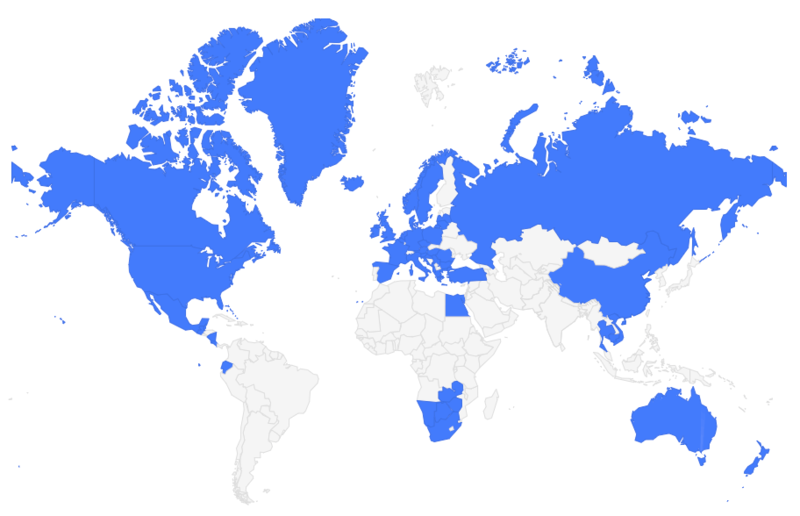 And, up until a couple of months ago, one of my biggest oversights was definitely the Baltic region – namely Estonia, Latvia, and Lithuania. I had heard such great things about all these countries: great architecture, great food, super-fast wifi, lots of history. And yet my travels had just never taken me to this northeastern corner of Europe. But then I found myself with a week of downtime in between a few weeks in the UK and a river cruise in Russia. And which region just happens to lie “on the way” to Russia from the UK? The Baltics, of course! And so it was that I found myself arriving in Riga, Latvia, for the very first time in early October. It was overcast and quite chilly, but the yellow-leafed trees and crisp air made me immediately want to get out and explore. I spent three days in Latvia's capital city, spending time both in the UNESCO-recognized Old Town and in the newer (and sometimes Soviet-influenced) parts of the city. What I found in Riga was a lively, beautiful, and very safe-feeling city that has a unique character all its own. Yes, you can still find Soviet-era buildings here and they now use the Euro, but Latvia has held on to a lot of its own traditions and history, too, from colorful knitted mittens to the old architecture and cobbled streets. While early October likely isn't the most ideal time to visit this part of the world (little did I know, but it would mark the start of nearly three weeks without any sunshine), I still found myself absolutely charmed by Riga. No matter what time of year you visit, you can experience Riga's history, architecture, food, and just downright cool vibe. And here are all the things I definitely don't think you should miss in Riga. It's cliche, perhaps, but Riga's Old Town was definitely my favorite part of the city. This part of Riga at the mouth of the Daugava River dates all the way back to 1201 – which means there's plenty of history here! I did a free 1.5-hour walking tour of the pedestrian-friendly city center (I went with and had a great guide), where I learned about the city's formation and saw some of the most popular buildings and squares. You definitely can walk around the center on your own, but doing a guided tour almost always gives you a better insight into what you're actually seeing. Whenever I'm in a new city, one of my favorite things to do is to find the best overhead view. Not only do I enjoy seeing cities from this unique perspective, but it often helps me understand the lay of the land better, too. In Riga, my top pick for a birds-eye view would be at the top of the bell tower of St. Peter's Church in the center of the Old Town. It costs less than 10 Euro to go inside the church (which now houses different art exhibits) and up the tower. And from the top you get fantastic views over the Old Town and the river. Another good spot for a high-up view is the Panorama Observation Deck, located atop the Latvian Academy of Sciences in the old Soviet part of Riga. The building itself – a symbol of the Soviet era – is worth seeing, and the views from the deck are also good. The Panorama deck is open every day April-November and costs 5 Euro to go to the top. In a couple of the above photos, you might notice the rounded structures lined up near the river. These buildings were constructed using the framework of old German zeppelin hangers left over from World War I, and this is where you can find Riga's Central Market today. This is a great place to wander or grab some affordable eats. I especially enjoyed the produce building because of all the colorful pickled things on display. While Riga's Old Town is full of impressive and photogenic medieval buildings, the city is also famous for its art nouveau architecture. In fact, over one third of the buildings in central Riga are of this ornate style, built during an economic boom in the late 19th and early 20th centuries. The greatest concentration of art nouveau buildings can be found in what is often known as Riga's “quiet center.” Look for these intriguing buildings on streets like Elizabetes, Alberta, Strēlnieku, Vīlandes, and Rūpniecības streets. Latvia was under the Soviet “iron curtain” from the mid-1940s all the way up until 1991. If you're interested in this part of Riga's history, Urban Adventures offers a really interesting tour called “.” This tour will walk you through daily life in Soviet Riga, have you visit the Russian corner of the city to see some markets and old Soviet-era buildings, and you'll even grab a drink at an old Soviet-style cafe. The Soviet Union had a huge impact on Latvia and its people (and is largely why you'll find many people speaking Russian there today), and learning about this chapter of Riga's past is a must for any history nerd. One thing that I didn't necessarily expect to find in Riga were so many parks. But Riga is actually a very green city, with a number of parks and gardens. My favorite park was Bastejkalna Park (Bastion Hill) near the Freedom Monument. Not only is it a relaxing green space, but there's also a canal running through it. If you have time, you can take a cruise along the canal in a little flat-bottomed boat. Other popular parks include Kronvalda Park and Vermanes Park, with the latter being home to the very cool (and cozy) Apsara Tea House. Want to see the best of Riga in one half-day? 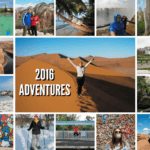 Check out the offered by Urban Adventures. This tour includes the Old Town, the Art Nouveau district, and a stop at the Central Market. If I only had one day to dedicate to exploring Riga, this is the tour I would book! How to get to Riga: I found a flight from London to Riga on Wizz Air for an awesome price using Skyscanner, which directed me straight to the airline's site to make my booking (I always use Skyscanner for flight searches in Europe!). – The #1 rated hotel in Riga on TripAdvisor. – A centrally-located boutique hotel. – A more luxurious option. What to pack: Looking for packing suggestions for Latvia? Head over to to see all my favorite travel gear! You can also pick up a before you go. Don't forget: Finally, don't leave home without a good travel insurance plan – because you never know what might happen! I recommend World Nomads for affordable basic travel insurance. Have you ever been to Riga? If not, is it a place you'd like to visit? *Note: My trip to Riga was partially sponsored by Skyscanner, and I also joined a free tour with Urban Adventures while I was there. But, as always, all opinions and recommendations are 100% my own. Riga has been top of my list for ages now – and these photos have just reaffirmed that I need to find a weekend to go ASAP! Yes you definitely do! It’s a very cool city – so much to see and do! How nice that you liked Riga! It’s always super nice to hear that tourists love our cities 🙂 I suggest you visit Jurmala the next time you’re in Latvia – it’s an amazingly beautiful resort town by the beach 20mins from Riga. Just came across your interesting blog about Riga. My husband,13 year old daughter and I are thinking of visiting Riga in Feb 2017 for about 5 days. Are there easy day trips to do outside of Riga as well? You mention Sigulda and Cesis. Are those good to go to? 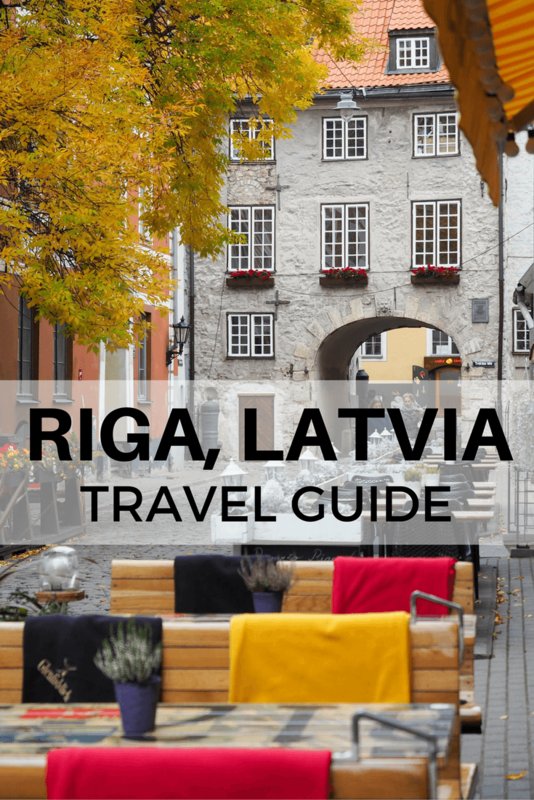 I personally didn’t do any day trips outside of Riga since I was only there for 3 days, but you could certainly do one or two if you have more time. I know Sigulda is popular in winter because it’s got lots of winter sports. I had heard the same from everyone I know who has been to Riga! And even though I didn’t have the best weather there, I really loved it, too! Luckily you can still see a lot there in just one day! Glad you enjoyed your short visit. Oh my word, who knew Latvia was so quaint yet so pretty! I know, right? Riga is so lovely. Haha, they like to pickle almost everything! I would love to visit the Baltics! The photos of the town look gorgeous! It looks like a typically nice town to have a wander around in and to sit at a nice outside terrace. Summer might be a better time to visit, but I do always like to travel in Europe outside the tourist seasons. Summer is definitely the best time to visit (I definitely want to go back! ), but it was very pretty in autumn, too. I’m not sure there would be a bad time to visit Riga, though! I’d love to visit! I haven’t made it out to the Baltics yet! It’s a very nice part of Europe that I would definitely recommend! True! I often have to remind myself of that when I wake up to a cloudy day and feel a bit sad. Nice! I’m not much of a clubber, so I’m afraid I can’t recommend any clubs for you. As for food, I had a good meal at Salve, and 1221 Restaurant is also supposed to be great (though is a bit pricey). I’m bummed that I haven’t been to Latvia yet, looks incredible Akatuki. I’d probably spend most of my time in though beautiful parks everywhere. Added to my list for next year! It’s a very cool city for sure! I’d love to go back in the summer to truly enjoy all the parks! Thank you for the article, I really enjoyed it, and the photos are also awesome. I am visiting Riga at the end of December and I will be spending New Years Eve there! Cannot wait to see it! That should be a lovely time to visit! I know they put up a big Christmas tree, and I imagine lots of lights and decorations! I really liked it – and I think the fact that I visited when there weren’t any cruise ships or big tour groups in town definitely helped. I felt like I had parts of the city all to myself! This article has gotten me so excited to book a trip to Riga, I’m super interested in the Soviet walking tour you mentioned! Awesome to hear! It’s a very cool city, and definitely a place I plan to return to! Awesome post! I just come back from weekend getaway in Riga and now I’m planning to go back for a week or two. Your tips are really great! I’ll add some to my Riga to do list! I was lucky to stay in amazing Airbnb right in the heart of Old Town and it was so beautiful! I could just walk to all most important tourist atractions. Restaurants in Old Town are simply outstanding and prices are amazing! Next time when you go back to Riga check out this Airbnb. Host super helpful and friendly! Iget so many insider tips and helpful info how to safe some money and see as much as possible! I’d love to go back to Riga, too – thanks for the Airbnb and restaurant recommendations! I was browsing about things I should know about Riga, Latvia and I found your blog. Very appreciate what you wrote here. Interesting, informative, and makes me confirmed about going there with my boyfriend instead of going to France. When he said our vacation will be spent in Latvia, I was surprised cause I know nothing about Baltic region. But one thing for sure, I’d love to spend our time together at the Bastion Hill instead of Eiffel Tower. Riga is a very cool city, with some beautiful architecture in the Old Town. I’m sure you’ll enjoy it! In two weeks it will be my third visit to Riga since last October fell in love with it. So many activities available to much to mention.or just relax with fine beers and food with welcoming locals that mostly speak good English.